Brie is the “biggest, cheesiest, sappiest romantic” who believes that everyone will find their perfect someone, so when Jacob, the love of Brie’s life, tells her he doesn’t love her anymore, the news breaks her heart, literally, and she dies. But now that she’s D&G (dead and gone), Brie revisits the living world to discover that her family has begun to unravel and her best friend has been keeping an intimate secret about her boyfriend. Somehow, Brie must handle all of this while navigating through the five steps of grief with the help of Patrick, her mysterious bomber-jacketed guide to the afterlife. But how is she supposed to face the Ever After with a broken heart and no one to call her own? 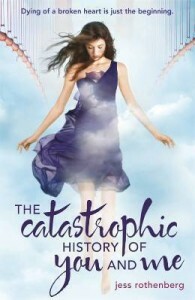 My friend Kai recommended The Catastrophic History of You and Me by Jess Rothenberg to me way back it first came out, but I never got around to reading it for some reason. Then one day, while waiting for some friends to pick me up in a bookstore in a mall that I’ve only been to once, I saw the new cover of the book and read the back blurbs. I don’t know what happened, but I decided to pick it up. Perhaps it finally piqued my interest? I can’t even remember if the words “letting go” were there, but in case they were, then it was probably why I decided to get it. Brie dies because of heart break, soon after her boyfriend, Jacob, breaks up with her. Impossible, yet it happened, and Brie wakes up in the afterlife, unsure of what exactly she needs to do now. She meets another soul, Patrick, who goes with her when she revisits her old life. Brie realizes the extent of the loss that the people she left felt, and how things were suddenly so far away from what she’s expected: her family’s breaking apart, her best friend “going out” with her ex. Brie being dead meant she couldn’t do anything about it…or could she? How can she move on now, knowing that everything and everyone she left are now so messed up? I didn’t really expect to love this book so much while I was reading it, but I did. Brie’s voice was fresh and snarky and so fun to read, that even if she was essentially dead, it wasn’t so hard to relate to her. I liked how Brie was such a normal girl, with her family, her dog, her friends and her boyfriend. Everything about her seemed normal, until she died, of course. But even so, Brie’s personality shone throughout, and I laughed with her, felt sad with her and I felt truly, truly happy for her when things started falling into place at the end. The book isn’t really about death per se — it didn’t answer the mysteries of life or anything — but more about grief, and moving on. I liked how the story was framed around the 5 stages of grief (denial, anger, bargaining, depression, acceptance), which is basically applicable not just to deaths but anything that we ever grieved for. Here, I read about how Brie’s family and friends worked through these stages, and Brie as well…and they didn’t handle it all spectacularly. Which is okay, because they’re humans, and we never really go through all those 5 stages perfectly and not have battle scars in the end. The Catastrophic History of You and Me is really more about letting go, moving on, and forgiving – others and yourself – and that part really resonated with me. I liked pretty much everything about this, except maybe the other backstory about this other character and the complications of souls was kind of dizzying. I mean, I got it, but a part of me kind of feels like it kind of came out of nowhere, and it was an additional layer that really didn’t need to be there. Except, of course, it provided a better resolution for why things were like that between them, but overall, I could do without it. Falling in love is pretty much the same thing as being eaten alive by a grizzly bear. News flash, Bozo. Don’t ever tell a girl to relax. It only makes us madder. You can obsess and obsess over how things ended – what you did wrong or could have done differently – but there’s not much of a point. It’s not like it’ll change anything. It was one thing to leave. But to be left. That had to be even worse. You’ve got to let go of this desperation. You’ll never have a chance of moving on otherwise. Maybe all heartbreak is created equal. The trouble is, sometimes words are like arrows. Once you shoot them, there’s no going back. May you always have love.